Sometimes all we need is a little inspiration to get motivated when it comes to anything – especially our money. If you want to start building real wealth, it takes a mindset shift. And the best way to learn the proper money mindset to have is to look at others who’ve excelled at making, earning, investing, and saving their money. 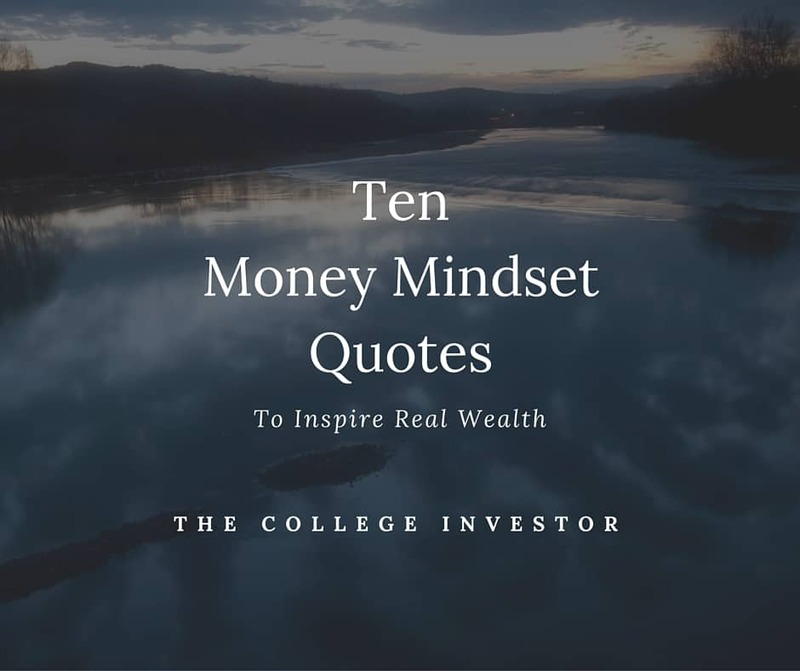 Here are some of my favorite money mindset quotes. They each mean something to me, and I hope that you find inspiration in them as well. This quote is awesome because it highlights one of the biggest mindset issues we all face: that I should have done something different in the past and it would make everything better today. Well, you can’t change the past. All you can do is change the future. And to do that, you need to start right now. This quote is what always leads me to remember the importance of front-loading my financial life. Why I should be doing something today and not putting it off. Keep it in mind the next time you regret something. Working both for an employer and for myself has really made me focus on what value I bring and what I should be paid. There is no truer statement than this – you can always just show up and get a paycheck. But your paycheck won’t grow, and you run the risk of losing that paycheck in the future. Or, you could focus on adding value, bringing your thoughts and skills to the table, and being the best at what you do. It doesn’t matter if you’re flipping burgers at McDonalds or running a company – it’s all about the value you bring. I can’t stand entitlement, and neither should you. Everyone has the power to go out and earn income. You can go get a job, you can go out and side hustle to make more money on the side. I’m a firm believer that everyone has the potential to earn at least an extra $100 per month. However, too many people are out there begging for handouts, begging for money, begging for student loan forgiveness programs. Rather than beg, change your money mindset and start earning! Too many people are scared to invest because they are afraid of losing money in the stock market. But the statistical truth is that it’s very unlikely that you can lose all your money investing. Even more so, when you go into investing with this mindset like Warren Buffett, you understand that you’re in it for the long run. So, when you start investing, create a money mindset for yourself that emphasizes the long term potential of your investment, and focus on that. Peter Lynch said this about investing, but it’s true in every area of your financial life. When it comes to what you have – the stuff in your house, your car, your investment – you should know exactly what you own and be able to explain to someone else why you own it. For example, I own this computer I’m typing on because I run an online business. I purchased this specific one because I wanted the USB connections for all the random things I plug into it. On the flip side, I had an old Canon digital camera just sitting in the cabinet. I hadn’t used it in years, and it was collecting dust. I couldn’t tell you why I still owned it, so I listed it on eBay. Always keep this mindset when making any purchases in your life. When it comes to money, the unexpected will always happen. That’s okay. The goal is to simply prepare for unexpected financial emergencies, and hopefully make the best of it. One of my favorite stories is the story about how Pat Flynn got his start in online business. He was already starting a side hustle and his main site, Smart Passive Income, when he got laid off from his job. He admits that he didn’t want to leave his job, and he tried to work at other companies as well. However, in the end, he capitalized on his misfortune and launched his business. Six years later he’s making six-figures per month. Unexpected, yes. But he was prepared and he made it work. There are a lot of variations of this quote that you’ve probably heard: luck favors the prepared, fortune favors the prepared mind, etc. I’ve even seen a lot of memes on Facebook and Instagram lately simply saying “Do The Work”. Why are so many people focused on this theme? Because there are no shortcuts. There are no overnight successes. Most overnight success stories come from people who’ve worked for years and prepared for the opportunity to arise. This is a great reminder that money isn’t the end all. It’s only a tool, a tool that can buy you stuff. Multiple studies have been done showing that you only need a certain level of income (which is $75,000 per year) to feel happy. Beyond that, the extra money doesn’t do much for you. But what money does give you is the ability to buy time. You can buy time by paying people to do work for you so you don’t have to. You can buy time in the form of experiences like travel. But all of this doesn’t matter if you don’t decide and drive your money towards your money goals. This quote is attributed to Joe Biden, but I know variations of it have been said for years. I love it because this money mindset quote really gets a lot of people thinking about what they truly value. In fact, our good friend Paula Pant recently chimed in on this same debate with a variation of her own: You can afford anything, you just can’t afford everything. So, if you want to save for retirement, do it. But don’t tell me you can’t do it because you go out to eat every night. If you want to travel more, do it. But don’t tell me you can’t do it because you buy every premium channel and spend $200 per month on cable. You can focus on what you value, and what you value reflects in where you spend your money. Going back to the quote above, you’re the driver and you decide where you spend your money. Don’t be one of these people that Will Rogers is talking about. Be better than that. Set a smart money mindset. 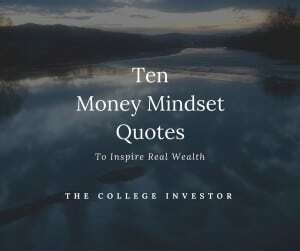 Which money mindset quote inspires you? Great points. The one that I think that many often forget is that there are no shortcuts. A lot of people want to do the right thing with their money and build real wealth, but they lose interest or get frustrated when they aren’t ‘rich’ after a short period of time. Building wealth is not something you just do and are done with, it should be something you’re always working toward. If people adjusted their attitude and their expectations, you would likely see a lot more results in the long run. Thanks for sharing! I also fall into that trap sometimes because a shortcut always seems nice – but it’s usually a falsity. You need to do the work. Good post, Robert. Some of these I have seen before and it is always good to be reminded of them. I really liked the Peter Lynch quote. Especially as I am getting older I need to be a little ruthless on what I am spending my time, energy and money on. Doesn’t matter your age – you should always be ruthless on what you’re spending your time and money on! These are all great quotations! Thank you for sharing. One of my favorites is the Will Rogers one. Walking around every day, I wonder how many people are living in that sad cycle.